I watched Vertigo in college, because I was in college and it was the sort of film you were supposed to watch. I liked it well enough and promptly forgot all about it. But for whatever reason, the film has recently resurfaced from the morass in my brain where old movies go to die, and so one night I biked down to retrieve a copy from the nearest locally owned video store (that is, I streamed it on Netflix). As you may know, it’s a very weird movie. 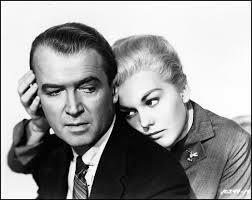 At its heart is Jimmy Stewart’s obsession with Kim Novak, which isn’t much of a mystery if you’ve ever seen Kim Novak. But I found myself marveling at the cinematic crispness of Stewart’s obsession. Here he is trailing her to an old Spanish mission, and an art museum, and San Francisco Bay. Eventually the two of them fling body against body against the moody wet backdrop of a redwood forest. Oh, sweet release. But it was the quieter moments that drew me in: Stewart tailing her in his car, or awkwardly interrogating the owner of an apartment house. The potential dangers behind every door, the frantic dread of losing Novak in traffic or the cold indifferent waters of the Bay. And studying Stewart’s face—pallid and sweaty, creased with hope and anticipation and fear—I realized that I’d had those same feelings not so long ago, but my obsession didn’t look anything like his. It didn’t look like much of anything. I envy his obsession, the narrative satisfaction of it. But it’s 2012. It’s hard to get there from here. So this is a story about a girl, and of course any time a guy says that it’s a dead giveaway that it’s really about him. Okay, it’s about me. You know my name, and I’m not going to tell you hers. But I’ve come to detest bland pseudonyms. If you’ve got a story about a girl named Lara and change her name to Anne, what’s the point? You may as well go all out. This is my story about Ms. Clarissa Applesauce. Some background: In the fall of 2008, I moved from Denver to Eastern Kentucky to take a job teaching English at a small university that will go unnamed. Due to the particulars of regional heritage (whatever that means), Nom de Guerre, KY was in no sense a College Town. It was, rather, a typically sad rural town that happened to have a university within its city limits. I took a small studio apartment just off of Mainstreet—a block of mostly empty stores kept that way by the two families who had owned it for decades and were determined to keep the 21st Century (and much of the 20th) from intruding upon the bucolic calm of their Appalachian paradise. I lived across the lot from Mainstreet’s most lucrative business: a drive-thru liquor store that opened at 7AM and did a brisk business with the early risers. So I declared my life television and Internet free. I had my music, my books. In this grand fantasy, I saw myself hunched over in my walk-in closet of an apartment reading Proust and Tolstoy, maybe even Finnegan’s Wake. Why not? We all know one hour of unperturbed silence has as many minutes as three or four hours of random Internet puttering or stupefied television viewing. Come Eastern Kentucky or high water, I too would live deliberately. In retrospect, I view this experiment as a scientific one: can a man survive for an entire year feeding on nothing but delusion? Because, of course, once stimuli were gone, I missed them terribly. Whatever the ultimate benefits might be of plodding through Remembrance of Things Past, they in no way could compete with the free and depressive clarity of clicking from website to website, seeking something, anything, to temporarily distract my brain. My daily routine went like this: teach in classroom, hang out in office with the magical “Internet” that existed there, come home to throw oneself down on bed or floor. Either nap or stare at ceiling. Eat. Return to office till midnight, drown self in Internet. Reflect on life. Contemplate buying volleyball to talk to. Without a scintilla of evidence to the contrary, pretend tomorrow will be different. I lived like this for nine months. But then (cue upbeat hopeful emo song), I met a girl—the aforementioned Ms. Applesauce. I struck up a conversation in Nom de Guerre’s only coffee shop, which was actually a small alcove off the town’s only bookstore. She was reading Slaughterhouse-Five. In what can only be described as my smoothest pick-up line ever, I asked her if she liked it. She referred to it as a great “cuddle-buddy.” I still have no idea what this means. But conversation ensued and numbers were exchanged and we planned to meet for a drink a few days later. I was a new man, and spent those intervening days in a whirl-a-gig of euphoria. I walked up and down the bombed-out streets of Nom de Guerre dreaming of all the adventures that awaited us—road trips to Nashville and Asheville, star-spangled nights camping out in the Smoky Mountains or romping through the cheap tourist paradise that is Gatlinburg, TN. These flights of fancy were ridiculous, but they sure beat lying on the floor counting the speckles in the ceiling. 1. She brought three friends. They talked in a closed-circuit about people I’d never met and events I hadn’t attended. 2. Besides her friends, she knew about 78% of the other patrons. (If you were born in Eastern Kentucky, it’s apparently impossible not to know at least 2/3rd of the people in any given room.) They swallowed her up. 3. She got really drunk. I got regular drunk. 4. I sat alone at the bar—oh, glorious cliché—for god knows how long and eventually watched her staggering out of the bar with her friends. Cue sad hopeless emo song. That night was only a prelude to the real story, which began the next day when she sent what I’ll refer to as E-mail#1. She apologized profusely, told me she was fresh from an abusive relationship. The abuser had been her fiancée. They’d set a date and everything. I wrote back something heartfelt and dripping with empathy. I’m pretty sure I included that James Wright poem about wishing words were grass. Thus began our electronic correspondence. She told me she was no good at this; she was shy and nervous. She needed to go slow. I returned to Colorado for the summer. We “talked” via e-mail and text message. I wore out the buttons on my phone crafting exquisitely edited texts. I drafted e-mails, printed them out, and sat outside on my brother’s porch late into the night revising until they were just right. I gently pushed for a phone call, but she had a thing about talking on the phone. It was too…immediate. Too close. Uncontrolled. And of course it was weird, and unorthodox. But those adjectives are right up my alley. Who wants a non-weird orthodox girlfriend? She convinced me to join Facebook, which up till then I’d successfully avoided on the basis of some vague, hard-to-explain principle. Sort of like the Indians who feared cameras could flash away their souls. But I was in the long grass now, and I guiltily clicked on her photos and Older Posts. My mother had taught me from a very young age not to be the kind of person who rifles through people’s drawers when they’re not home. But this was a new kind of house—windows wide open, not a locked door in sight. Or like a diary left open on the coffee table, adorned with a post-it note that screamed READ ME! I pondered every male face for hints—which one of these yokels was her erstwhile fiancée? Which were potential suitors? I took mental notes of her likes and dislikes, which didn’t disappoint. She liked The Godfather and David Bowie in Labyrinth. She loved Bob Dylan and obscure underground bands I’d never heard of. If my friends had invented a girl to torment me, they couldn’t have done much better. And still came the e-mails and text messages—every day, every other day. She’d text me when she was tromping through the mud on her parents’ stamp of eastern Kentucky soil; she’d text me when she had a nightmare. She sent YouTube links to songs, snippets of philosophy. I studied her e-mails and texts as though I could uncover hidden nuance and meaning—the lonely kabbalist at work. They couldn’t just be words. Too much was riding on this. “Too much,” naturally, being the omnipresent fear of another year of wretched Appalachian solitude. We made plans to meet again when I returned to Kentucky in August. August came. E-mail#58 (all numbers are approximate) made plans to meet for a hike. Two days later, Text#2,144 introduced a reason to delay. I would hear nothing for a week, then be greeted one fine morn by an e-mail explaining that some minor catastrophe—ex-boyfriend drama, sick grandfathers, the weather—was to blame. And we’d start over. I grew impatient and ever more confused with her excuses, which were legion and rarely creative. My only excuse, presumably, was desperation. To be fair, I was desperate. But also intrigued. She was smart, and interesting, and damaged in some irresistible Sylvia Plath (or, if you will, Fiona Apple) way that fed my admittedly naive Savior fantasies. This was 2009, remember—a time of hope. I was the change she’d been waiting for. Each new message was the proverbial shot of adrenaline straight into my atrophied heart. When two or three days passed without hearing from her, I grew restless and sunk. I’d send a text, and wait. Then a follow-up text. And wait. I’d send an e-mail, and wait. And wait. She seemed to have an otherworldly ability to gauge my level of frustration. As soon as I was ready to completely and irrevocably be rid of her there would come the familiar Pavlovian vibrating beep of a new text message to just-barely renew my battered hopes. Step forward, step back. Make plans and break them. This went on for over a year. Let’s not draw this sad story out any longer. But rest assured that I didn’t quit Facebook the first time I tried. And I couldn’t quit her. I knew it wasn’t healthy, but more than that, it felt like I was being jerked to and fro by a girl and a relationship that didn’t even exist. An unhealthy relationship I could handle, because at least it would pass the time. But this was metaphysical humiliation. If a normal face-to-face relationship is a simple (or even not-so-simple) math equation, then this was some abstruse mathematical proof full of symbols you’ve never seen before. Or else pure gibberish. I’d erase her e-mails and texts, and resolutely tell myself not to contact her or respond when she, with the painful regularity of an iTunes service agreement, butted her electronic head back into my life. My resolve would crumble as soon as my phone started to buzz or I’d see her name pop up in the e-mail tag. I don’t know what else to call it, if not an obsession. I don’t think Jimmy Stewart had anything on me. But I couldn’t explain it to my friends, or hardly to myself. The fact that it was playing out on a virtual stage was beyond humiliating. There was no “there” here. I rebuked myself for feelings that weren’t “real”—how could they be? Real things happened in the real world, a place of trees and tables and sidewalks and sticky barroom floors. This was happening exactly nowhere. Eventually she just stopped. Eventually I moved on. But what this odd not-love affair from an odd time in my life spurred me into thinking is this: so much of life today—its victories, defeats, confusions—now comes to us in ways that seem tremendously uninteresting. Even if I filled the long spaces between texts and e-mails with local color (and eastern KY has plenty of that), it wouldn’t change the fundamental fact that this massive and consuming event in my life was taking place on a stage bereft of what we would traditionally consider tension and drama. I was sitting in my office checking my e-mail, or sleepwalking through my days until my phone buzzed with an incoming text. Pathetic might be a word I’d use, but dramatic it was not. Nor was it evocative, or resonant, or any of the other chipper workshop words we use to describe effective prose. The great premise and promise of creative nonfiction is that—regardless of a few minor costume changes—these things are True. They happened to us, and they matter. But they also have to be interesting. What happens when our reality becomes not just somewhat, but remarkably nondramatic? What happens when the conduits through which our emotions flow seem frivolous and somehow beneath mention among civilized people? Beneath us they may be, but they’re still here. And they won’t be going away anytime soon. In the first act of Vertigo, Jimmy Stewart trails Kim Novak to the art gallery in the Palace of the Legion of Honor in San Francisco. We get the establishing shot: Ionic and Corinthian columns and a Roman arch. Very classical, very classy. Inside, Stewart squints at Novak, who sits prim and stiff on a bench and gazes up at a painting. A bouquet of pink flowers lay beside her. She wears a cold grey dress-suit. Stewart strolls behind her in his gangly way, in his ill-fitting brown suit, with his furtive glances. He holds his brown fedora loosely with both hands. Novak’s hair is pulled back in a coiled French twist. The background music works to heighten the sense of thick museum silence. No words are spoken. No words need to be spoken. And though Vertigo is, obviously, a work of visual fiction, that scene plays out in countless iterations countless times a day, in public spaces all over the world. A man looking at a woman. Deep feeling— lust, heartache, trepidation, hesitation, irritation—conveyed through fleeting glimpses and body language. No direct dialogue is necessary. Clarissa Applesauce and I had words; it was all we had. Words sent to one another through the ether, through broadband and wifi. Words that presented themselves out of a void. Words without accompaniment, without context or environment to inform or enrich them. Words, words, words. The transcripts would total hundreds of pages, but they wouldn’t add up to anything approaching a compelling or enticing narrative. Give me a rider on horseback passing love letters from one end of town to the other. Certainly I’ll paint you the local color: trees in full bloom or autumn rags, the wind through the rider’s hair or rain slanting violently down. The breathless gallop of the horse. But I’ll also give you the clanging of the bell announcing his arrival, the sky behind him as he stands framed in the doorway, his outfit, awkward greetings and pleasantries, the passing of the letter, the tactile feel of unfolding the envelope, a sense of the handwriting. We’re worlds away from that, of course. But even a phone call has its awkward pauses, stumbles, tonal shifts, accusations, affirmations, endearments, silences, frantic pleas, or the jerky breathlessness of pacing around a room. I can do that. And I can do the meeting of eyes across a crowded party, all gestures and posturing; or a walk through the park; or even the quick freighted brush of knee against knee beneath the table in a pizza parlor or coffee shop. But in the end, I haven’t the slightest idea how to write in full dramatic flourish of the highs and lows of my virtual Appalachian romance. And though I’ve since engaged in more traditional, “normal” (not to mention healthy) relationships, even these couldn’t be honestly rendered without the ways in which emotion in this second decade of the new millennium is bound up irrevocably with communication systems that didn’t exist a generation ago. A fun first-date is validated with a text good night, or a friendly e-mail the next day. Burgeoning relationships are punctuated with flirty and affectionate electronic missives, many of them containing grammar mistakes, truncated words, fatuous emoticons. Fights play out through the same satellites and wires. Who wants to read about that? And who wants to write about it? As far as I can tell, the answer is no one. The answer for most writers is to hit the IGNORE key. Which may be a feasible option, I suppose, for writers of fiction. Just pretend it doesn’t exist in our lives. Create a fantasyland where the characters act like it’s still 1992. Pretend, as they do on television, that drivers and passersby and coffee shop patrons aren’t all acting as though they have advanced OCD, or like addicts who can’t go five full minutes without chasing the virtual dragon. This is the new normal. This is how we live. Of course, not every event in our lives needs documenting. I’ve never felt cheated when a memoir doesn’t take bathroom breaks. But this omission feels different. We are engaged in a deliberate bout of wishful thinking, an almost childish game of “Let’s pretend.” Most people I know under forty (and that’s most people I know) dive into the Internet first thing in the morning. Even my friends who pride themselves on their hyperactive lifestyles—bouldering, skiing, rafting dangerous rapids—will plug back in as soon as they’ve finished their play-date with nature, and still spend significant hours of their days in front of a laptop or hunched over the computer that lives in their phone. Significant is the operative word. Shouldn’t these modes of communication be recognized for the multifarious and important functions they serve in our lives? Can they be, in any way, interesting? And if our creative nonfiction can’t find a way to integrate this great and/or sad truth about how we spend our days, what does that say about our craft? Maybe we’re just fiction writers in disguise, sweeping under the rug what we find distasteful or shallow or boring about modern life in order to tell those truths that we find more elevated, more heightened, less embarrassing. Just reach for the preordained grace notes. Follow the old script. Aim for the same rote moment of clarity or flash of insight. One more tired epiphany on top of a mountain. And to be honest, if I encountered a character in an essay or memoir who spent a significant portion of his days checking e-mail and reading texts—who acted as many of us act—I would almost certainly laugh. How preposterous he seems, grasping after his silly gadgets. A caricature, really. A flat one-note joke. I don’t have a solution to this problem. I read somewhere that one of many reasons The Simpsons is considered such a landmark achievement is because it was the first show to portray a family doing what families had been doing for decades: lounging around and watching TV. But that’s satire. It’s comedy. And while I might be able to successfully render my “unreal” relationship with Clarissa as pure farce, it wouldn’t be True. Maybe it was a farce of sorts, this connection built on clipped text messages and sitting alone in rooms at my computer waiting, waiting—god, the waiting!—for the next thrust of virtual contact, but there was also passion and anxiety and hope and desperation and secret sharing between two damaged souls. And none of it was funny. As a postscript, I should probably mention that I received an e-mail from Clarissa about a year ago. She was attending vet school on an island in the West Indies. She just wanted me to know, she wrote. She described how it felt to drift off to sleep at night listening to the ocean, to wake up listening to the ocean, to walk barefoot on the white sands near the ocean. All that crap. I composed my response as concisely as possible: Glad to hear it. Be well. But I couldn’t bring myself to stop there. What was the point? I asked her. Was there a point? Did any of it mean anything? It wasn’t a rhetorical question. I really needed to know. She got back to me in less than an hour. I wrote all about it in my diary, she said. I don’t want to re-write it all. Send me your address and I’ll send the pages. I doubt I can successfully convey just how gratifying was the promise of a tangible letter. I might never see her again, but answers were coming. The pages, either heavily-bonded and fancy or thin and cheap, would be torn, neatly or in haste, from a diary bought at some high-end craft store or maybe Wal-Mart. The pages would be covered in tidy printed script or cramped cursive, written with ink from a pen she had received as a gift or maybe cribbed from a motel. A pen she had actually held in her small and almost chubby hands, which I remember being oddly and cutely out of proportion to her thin frame. The pages would come in an envelope she’d sealed with her own spit, the lipped fold of the envelope pressed shut with the tip of her finger. The letter would travel physically from an island halfway across the world. It would pass through the hands of uncaring strangers. One day, jetlagged and road-weary, this letter would arrive in my curbside mailbox. I would separate it out from bills and coupons. I would hold it in my hands. Jonathan Rovner learned to write at Walnut Hills Elementary, just south of Denver, Colorado. His work has recently appeared in the Indiana Review, Wag’s Revue, and the 2013 Best of the Net Anthology. You are currently reading The Far Edges: A Story About a Girl at BREVITY's Nonfiction Blog.